GET LICENSED! QUALIFY IN LESS THAN 8 WEEKS! Each license course can be completed in as little as 18 days. Therefore, you can complete all three (3) in a minimum of 7.5 weeks. We offer a state-of-the-art online interactive program through Executive Programs Real Estate School. PASS THE STATE EXAM YOUR FIRST TRY! LAUNCH - provides an in-depth overview of the 7 topics featured in the state examination. EP Real Estate School brings the highest quality, professionally designed content and graphics, delivered in an engaging and highly effective power slide format. 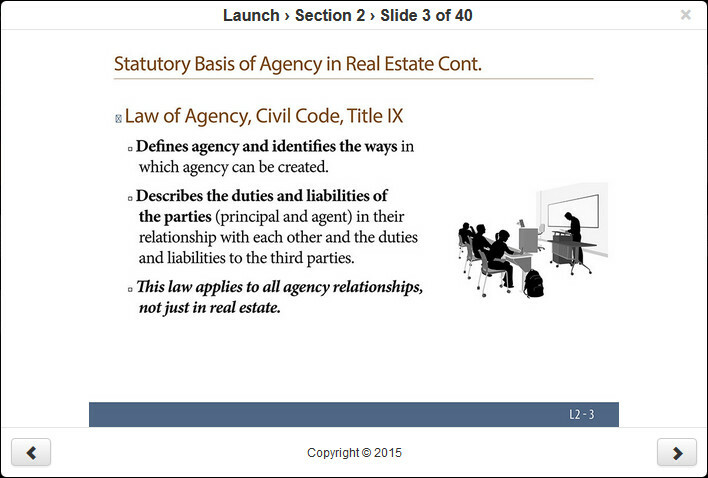 700 slides introduce the student to the real estate industry and techniques needed to pass the state test. PASSMASTER - offers slides with 700 questions, answers and explanations which help Students train to both memorize and learn why questions have specific answers. Passing the state exam requires repetition, recognition and understanding. Passmaster provides all 3 through this well designed and professionally written real estate test preparation flash card system. *TARGET TEST PREP* - features 1200 interactive simulated real estate practice questions organized into the 7 real estate categories of the California real estate sales and/or real estate broker license examination. Target Test Prep utilizes color retention reinforcement to help you master each practice question. In addition, your score will update with every 5 questions completed. Upon completion of each category, your score will reflect your strength or weakness. The Target Test Prep will track your score and allow you to retake each category indefinitely. Each time, you will be able to compare scores to follow your progress. In addition, students can discard questions answered correctly and repeat questions answered incorrectly to focus on areas of weakness. The TTP is a highly effective real estate test preparation training tool with a proven track record. Target Test Prep is tablet and mobile device compatible. CalBRE CE # 3874. Statutory ID # S0106.